I finished the body of the crochet market bag I’ve been working on, but I don’t really like it as much as I thought I would. I added in a few single crochet stripes before the large single crochet border and somewhere in those stripes, I must have added stitches because the top of the bag flares out in a way that really bugs me. 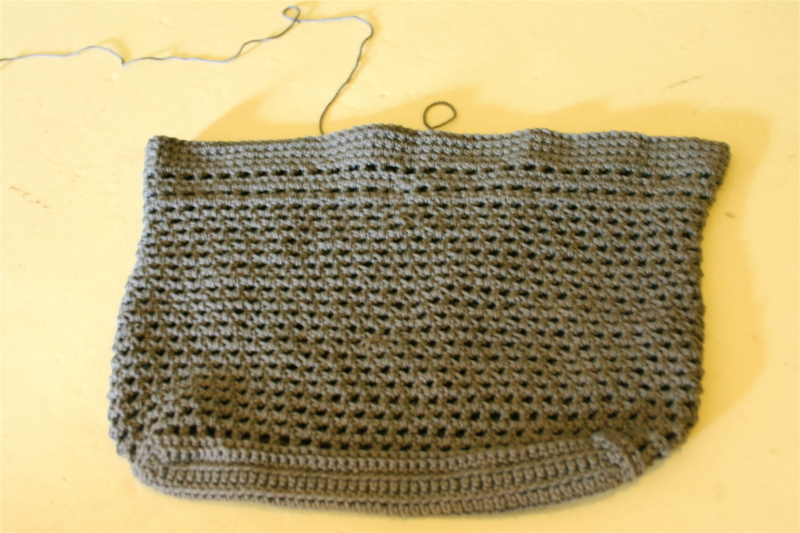 I’m thinking about ripping back a few rows and just doing the solid top single crochet border without the stripe rows. I think I’ll use the bag more if I’m not concerned about all the extra flared floppiness. In sweater design news, I’m currently contemplating exchanging some yarn I bought a while ago with a different pattern in mind. I have 14 balls of Knit Picks Swish Superwash, but they’re in two different colors. I think I want to send them back and get a non-superwash yarn for this sweater. Might be time to try out their City Tweed. The bag looks fine to me, but that “Yes, however I know something’s amiss feeling” is a hard one to shake off. Anxious to see your design!